Table Hockey Legend Meets NHL Legend Bobby Orr! 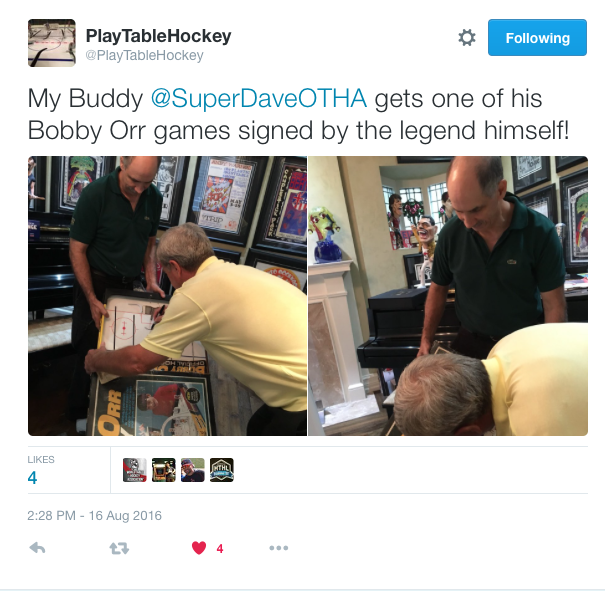 · The World Table Hockey Association, Inc.
Home / Area News / Table Hockey Legend Meets NHL Legend Bobby Orr! Table Hockey Legend Meets NHL Legend Bobby Orr! Table Hockey Legend, “Super” Dave K., Board of Directors, Co-President of the World Table Hockey Association’s operations in Canada, meets National Hockey League (NHL) Hall of Fame and Boston Bruin legend, the great Bobby Orr! “Super” Dave is known for having won many league and tournament championships over the years on a variety of different table hockey boards. “Super” Dave brought along a “Bobby Orr” model table hockey game manufactured by Munro company circa 1970s, and obtained Bobby Orr’s to autograph on his game. We know Dave was thrilled to meet Bobby Orr and to have another trophy to add to his collection. Here is a retweet and photo of Dave’s game being autographed. Super Dave K., Table Hockey legend meets NHL HoFer & legend, Bobby Orr!!! ← Previous Story You’re Invited to a Table Hockey Tournament in Edmonton!